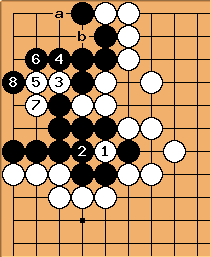 What if anything can White gain by playing here? 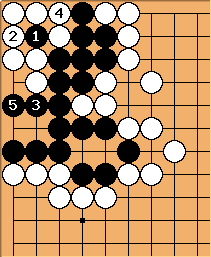 Looks like White can get a seki or ko to me. Charles From a game of mine last week. 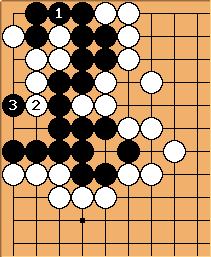 I thought the basic idea was the cut at for White, to gain points. Preparation for is obvious enough. White a for Black b would presumably been White's prerogative. 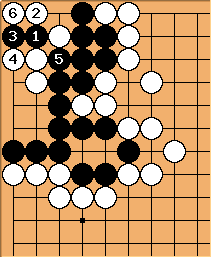 I didn't see a seki, but perhaps the position isn't exactly as in the game: I simplified it somewhat. So, caught me a little by surprise. Now it becomes important how many liberties the lower black group has on the outside. Charles So now Black is in a hurry to play ? Ah, but now I see that is too naive. DaveSigaty: The approach seems right for Black but here would be slightly better at (see below ) perhaps. And now? Could become a double ko? Bill: is, I believe, tesuji. Now White has nothing better than , I think, and the end result should be the same as the main line starting with the cut. But it is complicated. 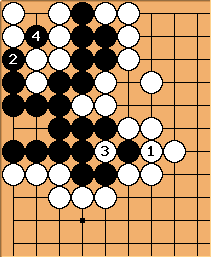 White has to play and after the sequence to , Black can play tenuki. 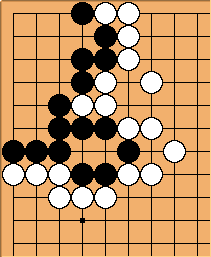 White has achieved a double ko that can provide unlimited ko threats, but in gote. Chris Goldsmith - I don't understand in the previous variation; surely B should just play here. 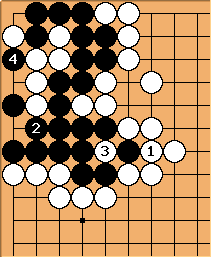 And then White is dead: a and b are miai for White's death. Charles (Hi Chris - quite a meeting on Monday!) In that case at will take the eye away in sente (or gain half-a-dozen points). A rare enough case of an intermediate play that works well. 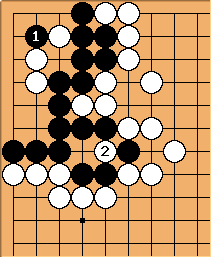 In comparison, this threatens to capture the outside ko and connect. 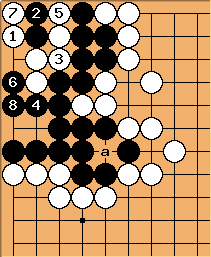 Black's capture of the inner ko is not atari on the white stones. Black has to play so White has created the double ko in sente. 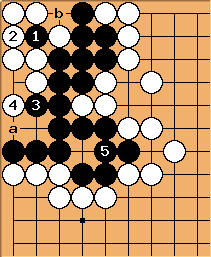 Bill: With the potential Black eye gone at a, White's next play is, I believe, to atari with and then connect at . Through White loses the capturing race, but forces Black to take all the white stones. - is almost always sente, since Black can rarely afford to let White make a huge ko. Alternatively, Black can connect with . Then prevents an eye for Black. wins the race. All roads lead to Rome, more or less.